Ray Green Interview with Bruce Duffie . 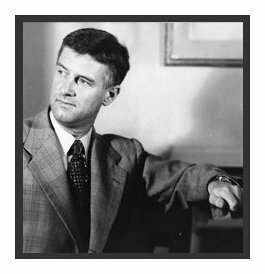 . . . . . . . .
Ray Burns Green (Sept. 13, 1908-April 16, 1997) was an American composer and music publisher who was born in 1908 (some sources give 1901, others 1909) at Cavendish, MO, near Avalon, and was raised in San Francisco, CA. The bulk of his basic musical training came in the city of the Golden Gate, where he studied under such personages as Ernest Bloch, Albert Elkus and Giulio Silva. In the mid 1930s, he won the George Ladd Prix de Paris, a two year composition fellowship from the University of California, Berkeley, to study modern music abroad. While in France, he studied composition under Darius Milhaud and gained conducting experience with Pierre Monteux. Instead of remaining in Paris as originally intended, he explored the continent but was disappointed with the state of music composition and returned to the United States to discover his own way. After his return in 1937, Green met May O’Donnell, an American modern dancer and choreographer, and wrote the score for her first work, “Of Pioneer Women”. This was the beginning of his career as a composer in the dance field. In 1938 at the Bennington School of Dance he wrote “American Document” for Martha Graham. 1938 also marked the year he married May O’Donnell and began their long and successful collaboration of music and dance. During the years prior to and during World War II he was composer-conductor, first with the Federal Music Project in northern California and then as a member of the Armed Forces. During this time, one of his main interests was in getting music accepted as an essential component to medical therapy treatment in the Veterans Administration hospitals. He was Chief of Music for the Veterans Administration, and in 1948 was invited to become Executive Secretary of the American Music Center in New York City, a position he held for over twelve years. 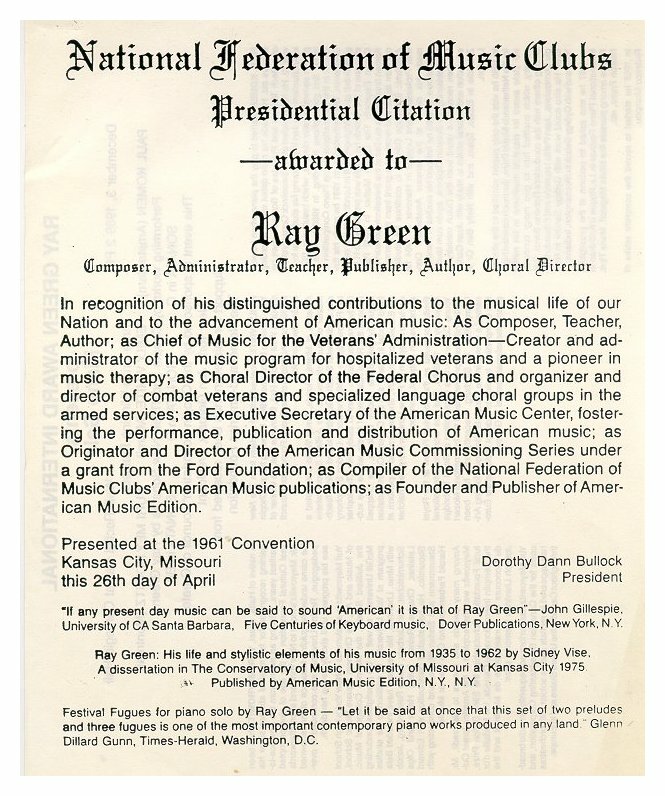 In 1951 Green founded his own publishing company, the American Music Edition (AME), which played an important role in documenting and disseminating new American music by Green, Carl Ruggles, Halsey Stevens, and many other composers. Consisting of manuscripts, business papers, and correspondence, the archive reflects AME’s repertoire as well as the interactions Green had with many key figures in twentieth-century music, including John Cage, Henry Cowell, Charles Ives, Gunther Schuller, William Grant Still, and Virgil Thomson. Perhaps Green’s most striking achievement during his years with the American Music Center was the development, in collaboration with the Ford Foundation of a commissioning series, which during 1957-63 resulted in multiple performances of newly composed American works by a half-dozen participating orchestras. In 1987 he set up the Ray Green Award which was the first piano prize where the teacher and the student share equally in the prize. Green’s influence was felt in the worlds of American music composition, music therapy, modern dance, and music publishing. He tried to create a new American music consisting of a harmonic system removed from the European tradition. This was signified by elements of American jazz, American folk music, Asian music, microtonality, music for dance and electronic music. It was never to be highbrow or too cerebral, but accessible to all audiences. Ray and May lived and worked together for over fifty years and became one of the most formidable combinations of composer and choreographer of their time, producing over forty collaborative works. He died at New York City, NY, in 1997. As composer, the titles of many of Green’s works bespeak his preoccupation with American dialect in terms of music, whether through evocation of hymn tune, country dance, or folk legend. One of his best-known works is Three Inventories of Casey Jones, which consists of two tiny movements that are really conventional piano solos, merely decorated by percussion, which frame a more substantial concerted movement. He completed his Sunday Sing Symphony in 1946. It does not attempt to capture or recreate the atmosphere of a “Sunday Sing,” nor is the work programmatic or descriptive but is based rather on the idea than on the substance of the “Sunday Sing.” Other such works by Green include Jig Theme and Six Changes, Country Dance Symphony, Four Short Songs to texts by Carl Sandburg, Sea charm and I Loved My Friend to texts by Langston Hughes, and Three Choral Songs to texts by Emily Dickinson. He also composed a non-subtitled Violin Concerto as well as Concerto Brevis for Violin and Orchestra. Sidney R. Vise wrote “Ray Green: His Life and Stylistic Elements of His Music from 1935 to 1962” for American Music Edition, 1975. In 1989, I wrote to Ray Green and included a copy of the WNIB Program Guide to show him what my series was all about. He agreed to have a conversation with me, and I called him at the end of September. As we were getting set up, he complimented me on how much contemporary music I played on the station. We spoke of various recordings and performances, and he indicated that some pleased him and others did not . . . . . . . .
Bruce Duffie: Let’s talk a little bit about interpretation. As the composer you set down pitch and duration, but how much interpretation do you want, and how much leeway do you allow the performer or the conductor when they perform your music? Ray Green: Basically I offer them the widest possible choice. In the case of the piece that we were just talking about, it went just a little beyond the limits of rational. Otherwise I am very pleased that the performer puts their interpretation in the piece. I really don’t believe in the metronome that much. I use it as a very handy tool, but I use a great deal of rubato in my compositions. BD: Yet this piece that you feel it didn’t work the way you want it to has pleased other listeners. RG: I know, and that’s where the dichotomy comes in. I don’t hold fast and hard on any conductor that’s going to risk his own neck in the interpretation of the piece. I’m out of the picture at that point. I choose safe grounds, as you noticed! BD: Do you ever have any thought of writing to the conductor of the recording, and saying that you were either displeased or dissatisfied? RG: No because I’d probably confuse him. He probably was very sincere in what he did, and so as far as my reaction to a performance, such as that one, is that it’s his interpretation, and it’s not mine in this case. I believe in a great deal of liberty for the performer and the performing medium, and especially towards these piano sonatas that I’m in the process of completing. There will be a whole set of twelve. I use a great deal of rubato. I indicate it in the score frequently, and hope that the performer will pick up the idea, because rubato basically means stealing time. You’re taking time from some other spot and putting it in here and there. The whole thing fits together was some kind of cement, but rubato is a very big part of expressive playing. All of these big-time performers engage in the practice on a very large scale. BD: Let me follow up on ‘expression’ and ‘expressive playing’. Is this what really constitutes the meaning of music? RG: Not necessarily. There’s a lot of other elements too. The real convention is the projection of, for example, a keyboard work, such as these piano sonatas. I try to write into the music enough natural guide posts that will save the day. So, if there’s a big question, it’s not going to be a result in any argument with me and the performer. The performers are always very happy if they can please the composers if the composer’s alive. It’s a very friendly business, but that’s the thing with expression — it cannot save a piece of music. You can’t get up and over-emote in front of an audience. A pianist can’t have singing with the music to try put the music across. The music has to be there, the dynamics or the other elements, too. Also the way in which the melodic lines are shaped, the harmonic framework — all of these elements are the organizing elements in a composition. BD: Is there ever a chance that things can be too organized or too tightly organized? RG: Well, sure. Then you get into the ‘dry old dust school’. BD: And then we’re back to expression again. RG: Well yes, but the thing is that, sure, oh, I believe that. For example, I heard a performance of the Sonata in D with Tallis Barker playing it. He is just a young kid — eighteen years old when he did it — and he did the whole thing by himself. His teacher, Seymour Bernstein, told me that Tallis worked out the whole piece himself. Tallis was not a very ‘talkity’ young person, but he did say that at one point that fortunately he played enough jazz that he knew what to do in the piece. That was a clue for me that he knew how to accent passages and bring out the rhythmic fabric was there. But if you look at the page, it looks like it’s pretty much cut and dried. But it isn’t at all when you play it, and especially at the tempo it is marked. It’s intended to go at a pretty good pulse, and he worked this out all by himself. In the more dramatic section — the middle section, the intermezzo — he used dramatic pauses. Maybe some other composer might object strenuously, but I didn’t. I found them very affective because he built up such a momentum before the dramatic pause. It’s an overlong pause — a Luftpause — that actually embellished the emotional effect of the sound itself. In a case like that, I would applaud his use of it. I mentioned this to the young girl who is playing the piece in December. She had done it last May in London, where she got very good reviews on the piece. I told her that some of those dramatic pauses that Tallis used I found very effective. I didn’t say she must put them in, I just said it as a suggestion. That is frequently the best way, instead of confronting somebody saying he or she left that out. That’s a pretty bland, blunt statement, and you don’t get very far with the performer. BD: So you look forward to performers discovering things in your music? BD: So then you expect the performer not just to play your notes but to actually work at getting under your skin as well? RG: Right. I was all for that. It worked out fine, and it does cross to the audience, too, by the way. BD: What do you expect of the audience that comes to hear a performance of your music? RG: I always hope that we make a contact and a connection, and establish a dialogue with the audience through the music. That’s the greatest hope of all, I’d say. BD: ‘Dialogue’ implies something coming back to you. BD: Have we gotten too obsessive about eliminating clinkers at the expense of interpreting the music? RG: Horowitz, for example, came to San Francisco and performed when I was going to school there. He was a young guy. I don’t think he was even twenty yet when they took him around the country, and he played all kinds of wrong notes. He was playing too fast probably. BD: And yet it made an overall impression. RG: Oh yes, sure, and he was a sensation across the country, because I was training my ear all the time that I was studying, I noticed the clinkers. It was part of the whole objective to train the ear, and the inner ear particularly, to be able to hear things without having instruments. One time Cortot was playing the Waldstein, and in the finale he made a mistake. He forgot a passage, and he loused it up. So, okay, he went back to the beginning of it, tried it again, and he did the same thing on the repeat. He tried it a third time and he still made the same mistake. BD: [Amazed] This was in performance??? RG: Yes, in performance. He finally just went on and finished up the piece. He was really a very angry because he made a really a foolish kind of mistake, but this was Cortot! Cortot was full of mistakes. I remember one time I heard him play the Twenty-Four Preludes of Chopin, and there were all sorts of mistakes in the performance. This kind of thing was not considered like it is now. Today they’re like surgeons. They’re supposed to be expert with that knife they hold in their hand. There’re all these wonder-boys and girls. They play everything right. BD: But are they lacking the emotion? RG: Well, most of them are. BD: We’ve been dancing around this question, so let me ask it straight away. What is the purpose of music in society? RG: I think it’s one of the most effective arts that we have in adding to the cohesion of the society. That is one of the great things that’s come out of the whole business of the so-called Nineteenth Century. If anything else, it’s that music has a big accent in our society today. We have lots of serious music played and listened to, and so I think that’s why I’m perfectly happy to go ahead and finish up these twelve sonatas because they are on the right track. They make a point with the audience, and get to the audience. They make a contact, and that’s what I’m after — giving the message out. BD: Is that who you’re trying to please — the audience? RG: Myself and the audience, yes. BD: You usually succeed, I assume? RG: Well, so far these sonatas seem to catch the ear. When you look at the old worn out diatonic system, technically they’re all dissonant chords all the way through, but they don’t sound like dissonance. BD: Is the diatonic system really passé? RG: Yes, sure. Chopin was the guy that started it all. He threw it out, really. His Preludes are the things that really set the whole thing up. They stay on a chromatic level from the first, but a number of the Preludes are very much outside the diatonic system. There are also a number of those Etudes that are outside the diatonic system. BD: In the last fifty years, you have watched music move away from accepted tonality, and now it seems to be coming back to accepted tonality. Is this a good thing or a bad thing, or is it just a thing? RG: As a kid I discovered what jazz accomplished which was the doing away of modulation, and writing in one key, one tonality. I began adopting that procedure because that was the natural thing for me to do, and I followed that all my life. I was writing in one key or one tonality in all of the pieces I have written so far, including orchestra pieces. As a matter of a fact, in a notebook that I kept from the early days, I have a big diatribe. I wrote down about how modulation disrupted the whole flow of music, and how divisive a custom it was to have these crazy modulations. They were meaningless, so Chopin had the right instinct. I know that he was aware of what he was doing all the time, but he was probably not even thinking in terms of the diatonic system, which was the way music was generally written in the days when he was alive. BD: You bring up Chopin. Do you feel that you, yourself, are part of a lineage of composers? RG: Yes, sure! I’m thinking in those terms. I’m not thinking in terms of this business or of the intellectual pursuit of trying to make puzzles, etc. out of music. I want the compositions that I write to be condensing pieces of sound. I use the word ‘sound’ all the time because that’s really the stuff out of which music is made up. Music is the very sophisticated art for organizing sound. BD: Is music for everyone? RG: I would say so; different kinds of music. When we get into the ‘rock ‘n’ roll’ deal, we get into three chords, and that’s for the simplistic mind. That works fine for the masses because there’s no need for them to know all about the very chromatic chords of Wagner, etc. There’s no need whatsoever. They can just sit and perhaps enjoy his preludes to the operas because the ordinary listener will be carried along by the impulse of the sound that he put together. RG: I think that I’m on the solid ground in saying this. It appears to me that music is in a very confused state at the present time. There’s lots of new music played. Even here in New York City, the orchestra does quite a few new contemporary pieces every year, and it’s somewhat a misfortune that the pieces are only played once and not heard again. That’s where recordings come in. I am very happy when they become a constant reminder of the piece of music they heard here at the Symphony concert, or if they heard a pianist play a piece. It’s of great importance that the work be heard more than once. Unfortunately, the big competitions set up by the foundations such as the Guggenheim, Rockefeller, Ford, and so on, the really competitions and these grants that they make are actually feathering their own nest by building up a big record as far as their support of the arts are concerned. They are always in favor of finding some young genius, and this young genius is going to be the great herald of the new age. Apparently they have some grandiose notions. I was fortunate to try out that idea back in 1957 on the then-Director of Humanities in the Ford Foundation. That department had just been set up, and he wanted a new idea. So I proposed the idea of these round-robin performances where I chose six symphony orchestras around in the country on a regional basis, and they all agreed to participate. BD: Which were these orchestras? 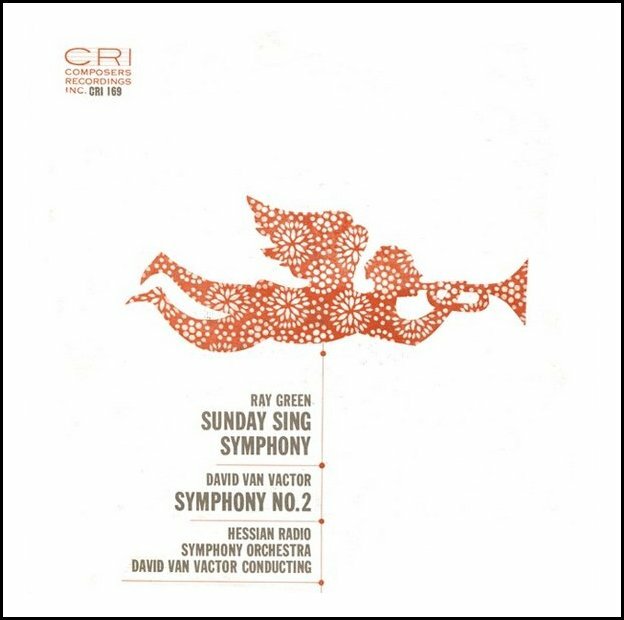 BD: Are we getting spoiled to the point where we expect a masterpiece to come out of every really new big commission, or every new first performance by one of the big orchestras? RG: I think so, yes! BD: How can we combat that? RG: Well, the thing is this star concept. The movies are the ones to really ruin the whole thing for everybody by manufacturing all those stars of theirs. They did that from the very start. As a kid I remember there were these big stars, and they had them on stage, of course, too. But that star concept became the norm, and it infects the piano field and all performing arts. This is especially a pernicious kind of situation in the dance field, for example. My wife is a choreographer, and we just were on in Oakland, California, two weeks ago, and we saw the performance of her Pursuit of Happiness. The Oakland Ballet did this modern work. The two techniques are shown, but there are a number of very marked differences in the way the problems are approached, as far as performances are concerned. The piece was accepted with great enthusiasm by the audience because it is happy and joyous. It’s one of those kinds of pieces that some critics might mistake as being a crowd pleaser, but it wasn’t that at all. It was simply that’s the way it came out. On the subject of pursuit of happiness, how can you be unhappy if you’re going to do happiness? RG: So that is a factor in my thinking about the sound of music. We’ve got to really realize that the human ear is a finite instrument. It is not infinite, and it won’t accept infinite proposals. The ear is a very, very discerning kind of receptor in our body. It’s much more receptive and much more choosey in deciding what it wants to hear than the eye. The eye will just look at all, even huge piles of garbage and still be very pleased, but not so the ear. The ear is a very rough master. It really insists that the listener pays attention to what attempt is being made to make contact through certain areas. They’re rather difficult for a general audience, and when I say that I include musicians in the audience and all sorts of people. For example, Beethoven’s greatest advertising piece that he ever wrote was Für Elise, and it’s probably one of the worst tunes ever written! But it made Beethoven’s name known to every pianist in the world. He just wrote it as a little piece for a little girl. BD: And this of course is especially true in the days before recordings made performances easily available in the home? RG: Yes, right. So all those factors are important. I take a very broad enthusiastic viewpoint towards writing music. I’m not writing music on a dismal scale. I’ve written plenty of pieces that make you sit up, and because of the stark dissonance that I worked in during the early days, they are rather shocking if you hear them now — especially if you were acquainted with my output at the present time. You wonder if the same guy wrote these pieces! But there are certain characteristics in those early pieces that I’ve used in my Sonata in F, which I’m working on now. BD: The characteristics are the same, but the language is different? RG: I think so. It’s as simple as that, basically. The structure, the way the sound is put together, is the framework on which the language, the vocabulary is strung along. Every composer that I know of in history worked out a vocabulary of his own, and used it. This is what made all the pieces of Mozart possible. RG: It sure is for me, but it’s hard work. I tell you, sometimes when the work gets to heating up, I have to quit and lay down and rest for a few minutes because my head gets hot even in thinking and concentrating. When you get under a tight spot, it’s pretty tough to try and figure out the way out of it. So, you get to concentrating so much, you don’t even know you’re sitting there concentrating, until you suddenly wake up to the fact that you’re practically sitting there rigid, and only just hanging on, or very much on an edge of conscious of what you’re doing! BD: When you’re writing a piece of music and you’re in the heat of composition, are you always in control of that pencil, or are there times when that pencil is controlling your hand? RG: I have plenty of rejected ideas. Oh Lord, the rejections are always more than the finished product. I put some in later or they are generally superseded. I mark them so I identify them. Every piece has things that I didn’t use. BD: But are you consciously in control of that inspiration, or are there times when you’re just almost in a trance? BD: Maybe some great theorist will tell you how you did it! BD: I want to be sure and ask you about the American Music Center. You were there for how many years? RG: It was just about twelve. It had been started by the group just before me. Let’s see, I’ll just try to recall four or five names. There was Aaron Copland, Otto Luening, Quincy Porter who was a composer who centered around Yale in his later years. BD: I never met him, but I’ve played some of his music on the air. RG: Good, because he’s a very nice person, really, a very talented composer. And Howard Hanson was involved in it. Howard never came to meetings, and that was kind of quaint because there was a provision in the bylaws that none of the original directors could be removed for any cause except resignation or demise. So, they had these originals in there all the way through. They elected me a member of the board when I was working at the job down Washington as Chief of the Music Division for the VA. This was in the hospital, a hospital treatment program, basically. I was the prime mover in getting the National Association of Music Therapy established. There are now several thousand member organization and a lot of big-wigs in it. I got music okayed by the VA to be put out on a prescription-basis. That had never been achieved before in history. BD: The listening to it, or the performing of it? RG: As a therapy for the patient. Karl Menninger (1893-1990) was a famous psychiatrist during that period in the mid-1930s. I went there and took a job at the Center in Topeka with him in 1936, and was there for about two and half years. Menninger co-operated with me, and signed a memorandum to the affect that music should be used in the medical program on prescription-basis. I took this back to Washington. BD: You say music should be used. Is this listening to music as it’s coming into the ears, or performing music as it’s going out through the emotions? RG: Well, both. Anybody who could play an instrument or wished to learn an instrument is always encouraged to do so. Some of the people working in this now have gotten to be quite esoteric about it. The major factor in organizing and setting it up as a national organization was to bring some common sense into the picture, and make it possible for various kinds of music to be tested in various psychological situations. So that was the big problem. Before this time, the Music Teachers National Association had a committee for a number of years, and Roy Underwood, who was chairman of that, asked me to come on and be a member. I was still with the VA then at that time, and so we put this thing together. We took care of all the educational factors, got it set up, and we even had it accepted by a number of universities and colleges around the country to set up a course in this. And by golly, they got the thing going, and now it’s flourishing as an assist in the hospital programs throughout the country. It too a practical operating magician, like myself, to get them to stir their stumps, as the old saying goes! [Both laugh] That was one of the nice things that came out of that thing in Washington. It was one of the very, very constructive things. BD: Coming back to the American Music Center, how did this tie in? RG: I was asked to come back and head this up. When I took the job in Washington, my wife and I had decided to try it out for a year or so and see how it worked. I was there for something over two years and then this offered me the chance to live here in New York. So I took the job. I had had lots of experience in San Francisco before I came, working with community groups and various other things, and about organization, etc. So I was quite confident in being able to measure up to the job. BD: So you were very pleased with what the American Music Center was able to do? RG: Yes, and with the fact that they had established a number of things that were very much apropos and pertained to the actual state of affairs in music. American Music needed promotion and I’m sure I went in on that basis, the promotion of American Music and this hoping about getting the grant from Ford. That was in the offing, and I had tried it out on a couple of conductors before I ever tried it out on the guy at Ford. So when we found out that he was very much for it, there was very much excitement around American Music Center because it was the first grant Ford ever made in music. It was $10,000. BD: Getting corporate support for the arts is really the right way to go? RG: It certainly is one of the ways that seems to be working today, especially in the case of the ballet companies. We know that the corporations are among the staunch supporters of ballet companies, because there’s a ballet company in practically every town in the United States. They get them organized, and I’m sure there’s a ballet company in Spokane, Washington, for example, and Keokuk Iowa, and Mobile, Alabama, just like there is in Boston and New York City and Philadelphia, etc. It’s the universal way of doing choreography, but then the modern work really had its real birth here in the United States. The Germans had prepared some ground, but when the Bennington College School of the Dance was organized back in 1934, then the modern thing became something on the map. They produced people like Doris Humphrey, Martha Graham, Charles Weidman, etc. My wife, May O’Donnell being a second generation, and now, of course, there’s just thousands of modern companies which tour around the country. Every college and every university in the country seems to have a big dance department now. So it’s a going concern. BD: Let me ask you also about your publishing company, American Music Editions. BD: You had a close relationship with Carl Ruggles. Tell me a bit about him! RG: Carl was a marvelous person, really. He had his own way of looking at things. At one time he and wife, Charlotte, would come down to New York every winter and spend the winter in the Chelsea Hotel on 23rd Street. BD: Where were they living in the summer? RG: Up in Arlington, Vermont, in the little old school house they bought many years before. They just lived in it, and they did nothing to it. It was just a little one room school house, and it was right there in this little village of Arlington. We would visit them up there frequently, so Carl would come down every winter and perhaps attend a performance or two, but not too many. We had one of those rotisserie things that you could put two chickens on and do them at the same time, so on Sunday morning I would have an extra chicken and we would take that up to Carl and Charlotte. They would have their own private chicken, and they loved that, of course. We had a lot of fun together. He was really a great guy, great fun and a jester. He told some marvelous tales. He told one story about John Cage, which was a true story. Virgil Thomson was living on the 8th floor of a hotel. He had an apartment, and that’s where he’s still living. Once in a while, Carl would be underneath him, or some years they’d be in another part of the hotel. But this year they were using the same elevator, and one day apparently John Cage had been up to see Virgil. Cage was coming down when Carl and Charlotte were going out. Carl told me he’d been waiting for the chance to confront Cage, so when the elevator stopped at the 7th floor, immediately under Virgil, who should be in the elevator alone but John Cage. So Carl and Charlotte got in elevator and started on down. Carl played innocent and said to John, “When is a cage not a cage?” John just stared straight ahead and gave no reply. So Carl says, “Well, of course, when it’s a John!” [Both laugh] [This is a variation on the old joke, “When is a door not a door? When it’s ajar!”] I asked him if John made any gesture, and he said that Cage didn’t even crack a smile or anything. I guess it was too close to home! [Both continue to laugh] He just absolutely reveled in telling that story because he was so much against all this business of posing this and that. He was capable of those kind of gaffs that he could pull, and could do it very convincingly. Nobody could really disagree or find any fault with what he did, because he did it so innocently. He could always laugh at his own jokes, of course. BD: Who were come of the other composers that the American Music Edition published? RG: I published David van Vactor, and Ross Lee Finney who was quite a well-known guy from Michigan. And I published a younger person, John Cooper, when he was getting going. I was acting as agent for John Cage at one time, as a matter of fact. I collected some money for him from NBC, which he couldn’t collect himself, but I could as a publisher. So I collected the money and gave it to John. Its quite a wide collection of names, including all the Burchard composers. I carried all their works, so it made up quite a large collection that I turned over to Theodore Presser in 1980. BD: One last question. Are you optimistic about the future of music? RG: Yes, I am, though it’s critical that we come to some realization about how music is going to function in the society. That’s what these Sonatas are about. That’s what this project, the Piano Gala we’re putting on on the 3rd of December is for. That is one way of getting to a willing, listening audience. This is not a competition of three pianos, by no means. It’s a co-operation of the three pianos in a participating event, and we think that others pianists around the world will want to participate in the project. We are, for example, interested in those people who didn’t win the last Cliburn. Those are the ones that are probably going to become musicians in the next generation. So we’re interested in those people. We’re not interested in whatever the judges said. I’ve been on so many panels myself, and I have some sense of how panels frequently work. I’m not in any way trying to condemn anybody or any panelists, but there’s so many factors which enter into these big international competitions that don’t have too much to do with music. I would like to see more relevance to the whole musical scene, and so May and I decided to take a chance and try this out. The Ray Green Award International is serious. If we get a fairly decent press on the thing, we’re intending to then expand it to the international level. Once they hear about the thing actually happening that way, they’re going to perk up much more interest to it. I don’t think we’re going to have too much trouble in getting pianists to participate, because they’re being paid. I’m paying each of these performers $1,000 for performing the Chopin Three Etudes, and each doing one sonata of mine. It’s simply not on the basis of an ego trip. This is something that has to do with music, and the continuity, and the idea of going directly to the ear of the listener; not to his intellect necessarily, but to the ear because that is the reception of sound. Then that is taken by the intellect and translated. BD: I hope it all comes off as you expect. This has been a great pleasure chatting with you this afternoon! I do appreciate your time and your interest. You’ve addressed many, many interesting questions, and I’ve learned a great deal about you and about music. RG: Thank you for the compliment! I certainly do appreciate your attention to what I am doing. This conversation was recorded on the telephone on September 30, 1989. Portions were broadcast on WNIB in 1993 and 1998. This transcription was made in 2015, and posted on this website at that time. My thanks to British soprano Una Barry for her help in preparing this website presentation.